When we first walked into Saint Mary's our initial reaction was, "It's dark." Not only did the dark environment allow the church's beautiful features to be hidden in the shadows, it also hampered the parishioners' involvement in the service. The problem was apparent; the environment was illuminated with the wrong type of fixture. The fixtures, originally picked by the architect, were custom made direct light canisters which created only narrow beams of light leaving many dark spots in between. The other major problem was that they were not visually pleasing and as a result were nicknamed "wagon wheels" by the community. When redesigning the lights for a church, we at Fredrick and Emily's keep three important factors in mind. 1. 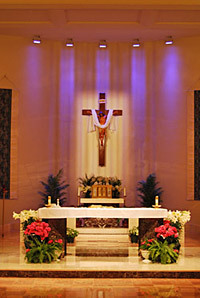 Do the existing or proposed fixtures work with the décor of the church? 2. Can the existing fixtures be made anymore energy efficient while also gaining light output? 3. Can we utilize new technology such as long-life lamps or LEDs, to provide years of maintenance free fixtures? 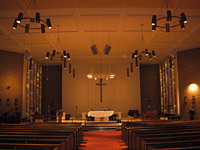 At Saint Mary's the solution was to remove all of the existing fixtures and relight the entire church using a combination of direct and indirect lighting fixtures. The new pendant fixtures utilized six 23 watt dimmable compact florescent bulbs per bowl. 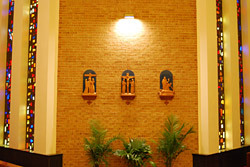 Our design also included new halogen floodlights for the sanctuary and long-life colored LED fixtures to wash the wall behind the crucifix. The entire lighting system is controlled by a DMX dimming and surge suppression system. The old lighting system required flipping approximately 20 circuit breakers to activate all the lights while this new system uses a single push button control panel. The previous fixtures used a total of 37 kilowatts of energy and each lamp only lasted for approximately three months while the new system uses about 16 kilowatts and the lamps last approximately five years. Now not only does the church have an even field of light throughout the nave and sanctuary but is also three times brighter than the original system. Additionally, we added colored LEDs to the wall behind the altar to reflect the seasons of the religious calendar. © Fredrick & Emily's Renovations, LLC. 2019. All Rights Reserved.